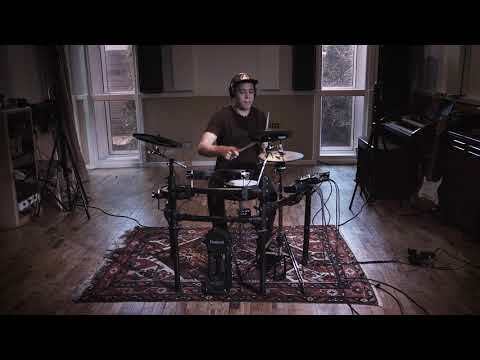 The Roland TD25 drum electric drum kit features sounds created using the incredible SuperNATURAL engine that Roland developed for .. 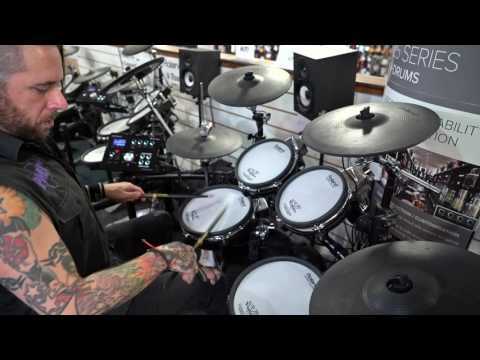 The Roland TD25 drum electric drum kit features sounds created using the incredible SuperNATURAL engine that Roland developed for their flagship TD-30 kits. A varied palette of sounds for jazz, pop, rock, electronic or any hybrid style your imagination can handle. Great sound is one thing but it's the integration with Roland drum hardware where the TD-25 really shines, offering you different articulations through flams, rim shots, swells and rolls. One incredible electronic brain for a truly expressive instrument. Along with being a great drum kit for live playing or in the studio, the TD-25 also offers a range of record/playback and practice features that allow you to get your chops down playing at home. With the TD-25K Drum Kit, serious drummers can tap into high-end V-Drums playability in a mid-level kit for home and studio. Equipped with a sound engine derived from the flagship TD-30, the TD-25K delivers all the acclaimed expressiveness that makes Roland’s top-line V-Drums the undisputed choice of pro players everywhere. A streamlined interface makes it easy to create personalized kits, while the built-in audio recording function lets you capture drum performances for evaluation and sharing. Other premium features include mesh-head pads for a natural feel, positional snare sensing for enhanced expression, and the VH-11 V-Hi-Hat for playing with authentic hi-hat techniques. The Roland TD-25K delivers a superior drumming experience, thanks to Roland’s SuperNATURAL technology with Behavior Modeling inherited from the flagship TD-30. The sound engine responds naturally and organically to your playing in every way, providing the dynamic, interactive feel that’s essential for reaching the highest levels of musical expression. From rim shots, rolls, flams, and ghost notes on the snare to dramatic crash hits and sustained cymbal swells, every nuance is detailed, accurate, and ultra-smooth. To keep everything in place, the TD-25K features a newly-upgraded MDS-Standard Frame. A natural evolution from the MDS-9V frame that offers plenty of space and support for your kit. When you sit down at the TD25 K, you’ll enjoy expressive playability that rivals high-end V-Drums sets. There’s a full compliment of mesh-head pads for the legendary V-Drums feel, with positional sensing on the snare pad that provides subtle, organic tonal changes depending on where the pad is struck. The cymbals have a natural swinging motion and support chokes, bow/edge sounds on the crash, and bow/edge/bell sounds on the ride. Mounting on a standard hi-hat stand, the VH-11 V-Hi-Hat features open/closed motion and bow/edge sounds for executing traditional playing techniques to perfection. Last but not least is the KD-9 Kick Pad, which offers a natural-feel cloth head and rock-solid response. With its no-nonsense interface, the TD-25K’s sound module lets you enjoy playing great sounds for any music right away. Easy to grab while holding sticks, the large centre dial allows you to quickly select kits based on music styles such as standard, rock, jazz, electronic, and others. After you’ve selected a style, press the dial to toggle between different kit variations. Next step? Start playing! The Roland TD-25K makes it simple to edit sounds to suit your playing touch or a specific style of music. Just hit a pad to call up the sound assigned to it, and then use the module’s knobs to select instruments and tweak tuning, muffling, and levels. Handy shortcuts greatly speed up tom editing, allowing you to assign sounds and change the muffling and tuning for all the toms at once. Your changes are saved automatically as you edit, eliminating the need to fuss with extra steps. If you don’t like your most recent tweaks, you can easily undo them and return to where the kit was at when you first selected it. Want a little jamming music to play along with? Just load up a USB memory stick with favourite WAV/MP3 songs and get lost in playing for hours. In addition to normal playback, you can loop sections you’d like to work on, or slow the playback speed to more easily learn fast fills and articulations. Alternately, you can plug a smartphone into the audio input and drum with songs from your music library or the web. It’s also possible to record your drumming performances (along with music playback) as audio files to a USB memory stick, offering a great way to evaluate your playing and share your drumming with friends and music producers. The sound module is equipped with a USB host port as well, providing a convenient connection for recording audio and MIDI data directly into DAW software.